We loved the last curriculum we tried out from Memoria Press, so we were excited to try out another of their offerings! We’re reviewing Classical Composition I: Fable Set. It’s a writing curriculum, and we’re using it for our homeschool writing curriculum. My son is 11, just finished with 5th grade, and is what we’ll call a “reluctant writer.” He talks non-stop and is full of ideas, and can make a pretty decent paragraph and write a grammatically correct letter or email message. I’ve used several homeschool writing curricula with him over the years to try to teach him more writing skill, but nothing specifically classical. He’s got some of the basics down but he’s definitely still not a kid who’s going to write unless I specifically assign it to him, and even then he needs a lot of direction to get much down on paper. What’s in the Classical Composition I: Fable Set Writing Curriculum? 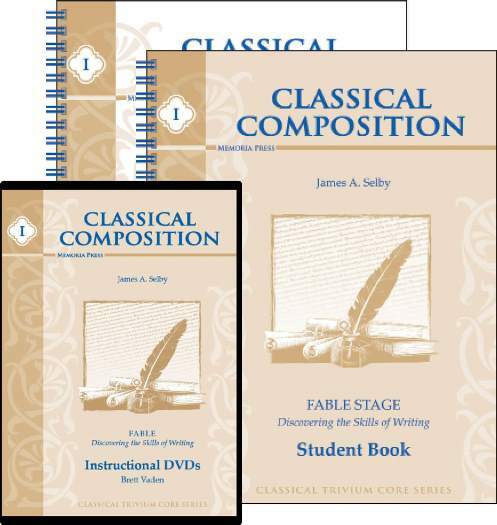 We got the Classical Composition Teacher Guide, the Classical Composition Student Book, and the Instructional DVDs to use as our homeschool writing curriculum. The student book is consumable and needs to be purchased for each student using the curriculum. The teacher guide and DVDs are re-usable. I definitely think that if you use this program you’ll need all three – the teacher guide, student book, and instructional DVDs (more on that later). There are four instructional DVDs inside the box, so, in other words, quite a lot of instructional time. There are twenty lessons in the writing curriculum. It took us two weeks to get through just one lesson. We school four days a week and used it daily. Each day’s part didn’t take a really long time, varying from 10-20 minutes. The first day took us longer each week, which is usually how I plan things. Some kids could do that faster, some slower. I’d say it’s very reasonable to take a year to complete this writing curriculum, especially if you have a reluctant writer. How Did We Use the Classical Composition I: Fable Set Writing Curriculum? Overall this worked really well for us, and we’re happy and going to continue using this writing curriculum. BUT, I was so worried when the curriculum arrived and I looked it over again. I’d read the description before choosing it, and I really thought it would be a great thing to try, but then when I looked inside and saw things like labeling plot components and the fact that it uses vocabulary like “anemographia,” I just thought this would be wayyyy too hard for my 11 year old reluctant writer who has never used any classical curriculum before. Were these concepts that could easily be picked up at his stage, or would I need to do a bunch of prep work to get him up to speed? I looked through the teacher’s guide and thought, “Well, the answers are in here, so he could just copy those, but how do I teach this stuff to him when I have never used this kind of thing, either?” The teacher’s guide has discussion points but I felt like I needed to be more familiar with the content and style to be able to do a good job teaching it. Enter the instructional DVDs. Neither of us are particularly patient with many instructional DVDs, but these were very well done. I didn’t have time to watch every lesson on the DVD (as I said this curriculum will easily take us a school year), but we skipped ahead to preview some future ones that we didn’t get to yet. The speaker is clear, a real person, and basically like sitting in class and listening to a teacher give you a short, well-planned lecture. This is a great alternative to a local writing class, and definitely a great alternative to an online writing class. I like local classes, but let’s be real, they’re not always in the budget, in the calendar, or even available at all. My kids do a lot of other classes and so a local writing class is not going to happen for us. I don’t know how I’d begin to teach this well without the instructional DVDs. I need them. We need them. Our experience with the DVD lessons was great. Basically, we watched the DVD together and as my son had questions, I used the teacher’s guide to provide examples and some further guidance. The DVD covered things really well. My son had no problem doing all of this, the first lesson, on his own, using only the instruction he got from the DVD. He wrote an extra list of all of his favorite types of trees because he was enjoying that part so much. Folks, voluntarily writing something extra isn’t something that happens a lot with him. I think he liked the challenge, funny enough. The rest of the parts of a lesson involve writing an outline and then re-writing as a paraphrase (he’s gotten pretty good at this because I’ve spent a long time on that with him in the past). The paraphrases add Anemographia, Dendrogrpahia, and Ethopoeia. It then goes a step further and has the student rewrite the story by reduction, which is just boiling the story down to the bare bones of what happened. Then, there are some variations using synonyms. The lessons follow the same pattern throughout, which makes it easy to plan lessons in advance. So far the Classical Composition I: Fable Set Writing Curriculum has been a frustration-free experience for both me and my son. As I said, I was worried at first because of the unfamiliarity of it all, but the program is not difficult because it is set out step by step and explained thoroughly. We’re both very happy with it and we’re still using it. The other Memoria Press curriculum we reviewed this year was Music Appreciation, which we’re still enjoying. You can read more reviews of this writing curriculum and other offerings from Memoria Press.